Hayling Island Labs - After Hours: OK, so is this the bit of pixie dust we needed? OK, so is this the bit of pixie dust we needed? So, the motorcycle was fitted with a refurbished starter motor. And now, it turns over fine every time. However, I still have a bit of a problem starting from warm. It's OK when it is cold, OK when it is hot, but in that midrange, you know like run the bike, leave for an hour or two and try to start it again, it struggles. Since the ferry ride is 45 minutes, it can be embarrassing when it won't start when it's time to get off. It does seem to start on a stand better than when I am sat on it. However that might be just coincidence, since it is usually when I have failed to start the bike, and then I leave it for five mins and just spin it up one more time while it is standing there. 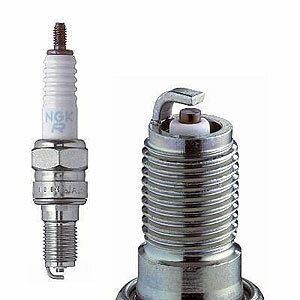 So, next I thought, time to change the spark plugs. That will give me a chance to have a look at what is going on inside the engine - are they black with soot, and so on? So any way, the routine for changing the spark plugs is the same as everything; remove seat, remove tank, remove air cleaner (bought a new air cleaner element just in case) and then pull plugs out. I even bought the right size plug spanner, and 3/8 inch extension bars ready to go to reach the spark plugs way down in the engine. Pulled them out - very disappointing - nothing really very wrong with them at all. Not been burning too hot; not been in the bike very long to be honest. They had a little bit of blackening, and the gaps were set very wide. I did note some slivers of metal on two of them when I pulled out the new plugs. Odd, that. Maybe they had been over-tightened. I thought about not replacing them, but I have a new set already delivered anyway. Then I noticed that the new ones weren't the same as the ones I have just pulled. So the set I pulled out off the bike are NGK CR9EH .. which have a profile like this one. I checked the manual several times, and googled for them, and yes, the ones I have bought to replace the plugs are the correct ones, not the ones that were on the bike already. 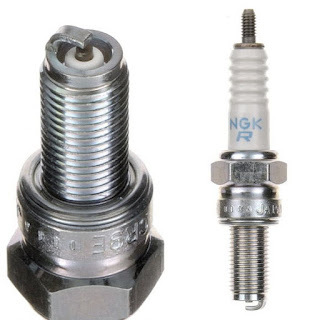 The keen eye will note that the correct plugs have a thread that goes all the way, and allows the spark to protrude into the correct place in the cylinder head. The ones that were on the bike have a shoulder, and even with over-torquing the things into the head and damaging the top threads, won't put the spark in the right place in the cylinder head. I know that this is the risk one takes when buying a bike from eBay; maybe not unique to eBay, but the history of people futzing with the bike is unknown, and there are an awful lot of ways of cocking up, but this is just careless. On top of the starter motor that was on its last legs, the starter solenoid that had been borrowed from another bike and jerry-rigged into place, and the unique changes to the wiring loom that have been made, starting to wonder about my new girl. Bike starts well now, but we will see how allergic she is to ferries again this week. Fingers and toes crossed.